Do you ever wonder what makes people who are always thinking positive.....well...always thinking positive? Does it boggle your mind how some people seem to take even the greatest strokes of bad luck with a grain of salt, while you seem to constantly stress over the littlest things? Do you ever wish you had the capability to remain calm and positive at all times......even in the face of great adversity? 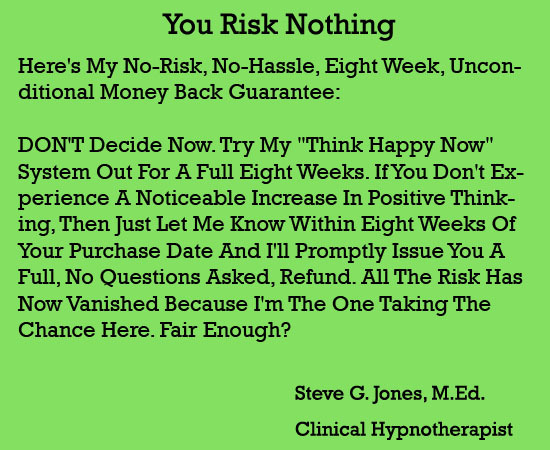 I’m Dr. Steve G. Jones, Ed.D., clinical hypnotherapist, and I’m here to tell you that your ability to think positively is directly related to both your ability to achieve success and your overall quality of life. I won’t take much of your time, but I think it’s important that you realize that there is one single factor that will ultimately enrich your life with happiness regardless of how much money you have, how wonderful your relationships are or fulfilled you may feel.......and that one factor is your ability to think positive. The reason for this is because your reality is nothing more than your perception of reality. Your perception of reality lives within your mind. Therefore, if there is negativity dwelling within your mind, it will eventually manifest into your reality. Positive energy within the mind or positive thinking as we know it will do just the opposite. 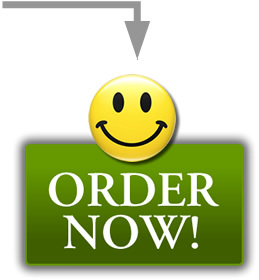 It will enrich your life and enable you to attract happiness beyond your wildest dreams. I meet with people every day who have experienced everything from losing a loved one to having their house foreclosed on to getting fired after working for the same employer for over 20 years and they feel as though they are left with nothing. And here’s what I can tell you; the minute I get them to start thinking positively (no matter how shattered their worlds may seem) they begin attracting immense amounts of joy into their lives. The True Meaning Of Thinking Positive - To first understand how to think positive, you must first understand what thinking positive really is. I’ll reveal that and more in this chapter. How To Simultaneously Build Confidence And Shatter Barriers - Sounds almost impossible to do, but this is what will set you up for success and I’m here to ensure you develop the capability to both at the same time. The Impact Of Optimism - Here you will learn how to build the foundation that will forever support your new outlook on life. Where Your Motivation Comes From - Discover how and where your motivation comes to be, so you can tap into the supply whenever you need it. How To Completely Restructure Your Frame Of Mind - Out with the old, in with the new. Here you will discover the secret to changing your reality. How To Remain Positive Forever - Here I will give you 10 time tested techniques that will keep your newfound positive energy flowing permanently. How To gain Enjoyment From The Place You Will Spend Most of Your Time - Here I will showcase my top 10 techniques that enable you to find joy in what will ultimately consume you. Finding Positive Emotion In Today’s World - Let’s face it, the world is a tough place to be right now, but here you will learn how to overcome the mental obstacles lurking in today’s world so you can think positively indefinitely. If you are sick and tired of seeing your world shattered because you cannot make a simple shift in your ability to think positive, (like many others have) then you need to take advantage of this unique opportunity right now. Enabling yourself to think positively may be the greatest thing you can ever do for yourself. And right now, I can help you do just that and more, as I have been doing for thousands of others over the past 25 years. Only now, instead of paying $25,000 for a private session at my Savannah office, you can now reap all the same rewards for just $47 $19.95! And to make certain that you follow my system, I’m even going to give you a FREE gift as a bonus! 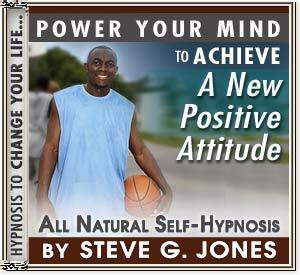 Power your mind with hypnosis to stop being overwhelmed with negative thinking & achieve a new positive attitude! Break old thought patterns to truly become more outgoing, energetic, enthusiastic - and more magnetic - start to really love life! Program yourself for change as you sleep!